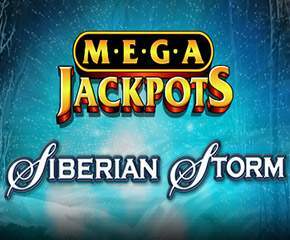 Mega Jackpots Siberian Storm is a five reel slot and has 720 possible ways to win. It is similar to Siberian Stormslotswith slightly different payouts and added jackpot prizes. Among the various slots from IGT, this slot is a little bit different with a Multiway Xtra Feature added which means the gameplay is from left to right as well as from right to left. 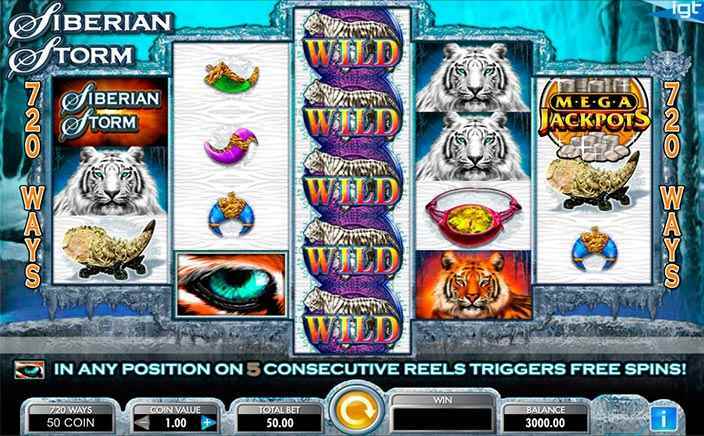 You have to find tigers and other treasures as you have done in its predecessor game, but this latest slot finding became more interesting with added jackpots and big payouts.The background is of chilly Siberian forest and the game introduces itself with some snow tigers roaming behind the game name “Mega Jackpots Siberian Storm”. Start your trip with a minimum bet of £0.50 to the maximum bet of £500. You can get in return the prizes of up to 400x your bet or even higher. The high-value symbols of this slot are a white tiger, a tiger and the game logo with 5 low-value symbols which includes various well-drawn relics. The special symbols are the wild symbol which is a white striped tiger with initials Wild written on the symbol and the scatter symbol is the green eye symbol. The Wild symbol, as usual, can substitute for any symbol except for the scatter symbol and can complete the winning combinations. Multiway Xtra: This new feature from IGT is active throughout the base game, means that wins pay from left to right and right to left. If the same symbols are in adjacent reels there is a win otherwise a multiplier will be awarded if the symbols are in the same column. If you manage to land 5 green eye symbols on consecutive five reels starting from left or right, you will get to play 8 free spins. This feature can also be re-triggered and by this, you can get up to 96 free spins. Moreover, if you manage to land the orange eye symbol (which appears only during the bonus game) you will get another 8 free spins. Like this, you can win up to 240 free spins during the bonus game. Like Siberian Storm slots, this one too has the same theme, background and sound with an additional progressive jackpot feature. This makes Mega Jackpots Siberian Stormslots even more interesting. The good news is that you can play this slot both on your computers as well as mobile devices since it is very much compatible.